At face value, Shiva might seem to be an evil god, but this transformation is absolutely necessary to begin a new cycle of life. In many Western and Native traditions, there are only two: Father God, the creator, and, Mother Earth, the bearer of life. Actually, the Earth Mother is also the taker of live as well, as everything born must also at some point die. This taking of life by the Earth is often underplayed in many traditions but it is scientific fact. Unfortunately, in Western traditions, death is seen as an evil force, or a ghastly figure as with the Grim Reaper. The Hindu perspective has a different viewpoint concerning death, namely that it is simply a part of life. Those of us in the West could benefit from seeing death as a god, a benevolent god, who is no less part of the process than the creative and sustaining aspects. 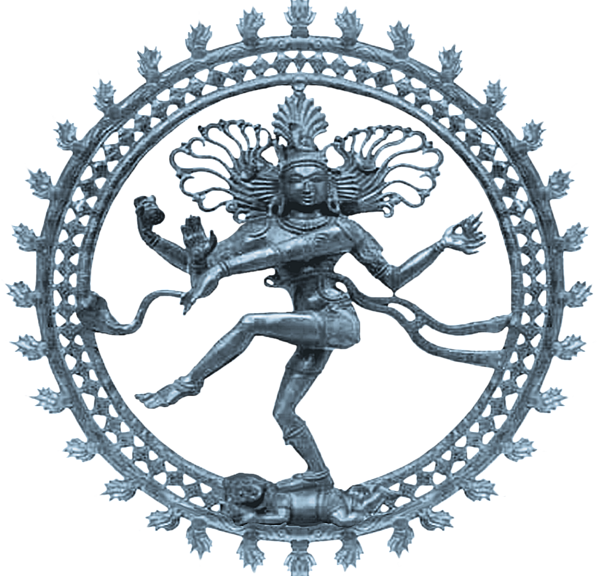 The imagery in Shiva is complex and very interesting, especially in the Nataraj, which is sometimes called the ‘dancing Shiva’. Everything within the ring of fire is in motion, from the hair representing the sacred Ganges River, to the drum beating the heart of the universe and the arm poised like an elephant’s trunk to plow through obstacles. The only static part is the foot which is stepping on the dwarf of ignorance at the bottom. This interplay of constant motion and unchanging stability reminds of the life and death cycle. Psychologically, we can conjure up the power of Shiva when dealing with those parts of our life that need to be transformed, or destroyed. Take a bad habit, for example. This habit was created at some point and by constant repetition, it has been sustained over time. Now that the habit no longer serves us, we can call upon the Destroyer to take it back to where it came from. Anything that has been crystalized, such as old beliefs or immature emotions and reactions, needs to be broken apart and rebuilt again in a new form, one that better suits your needs at this time. This transformative power is also helpful when facing the inevitable changes that occur in life. Puberty is a prime example, as everyone must go through this change, whether we want to or not. We have been given life, nourishment to sustain living, and now, Shiva shows up to take the child away – or kill it off, symbolically – so that the adult can be ‘born’ in the body. The organism continues, but is now transformed. Other life changes through different stages, such as leaving home, parenthood, the empty nest, retirement and old age could be faced more graciously with this Shiva energy. Through each transition, you are still you, but a transformed you, and you can’t go back. By incorporating Shiva symbolism and honoring this destruction as a benevolent force, these changes can be better approached with acceptance instead of resistance. The things we want to change, and even the things we don’t, are all participating with this transformative energy as it is part of life, nature and the universe.